With Father’s Day just around the corner, we took a look at some of our favorite TV dads for a little bit of guidance on the journey ahead. 1. Go to college. Even though student loan debt is at an all-time high, you should still consider a continued education. Graduates still out-earn people without degrees, which is great, since someone needs to pay for those loans when Sallie Mae starts blowing up your phone. 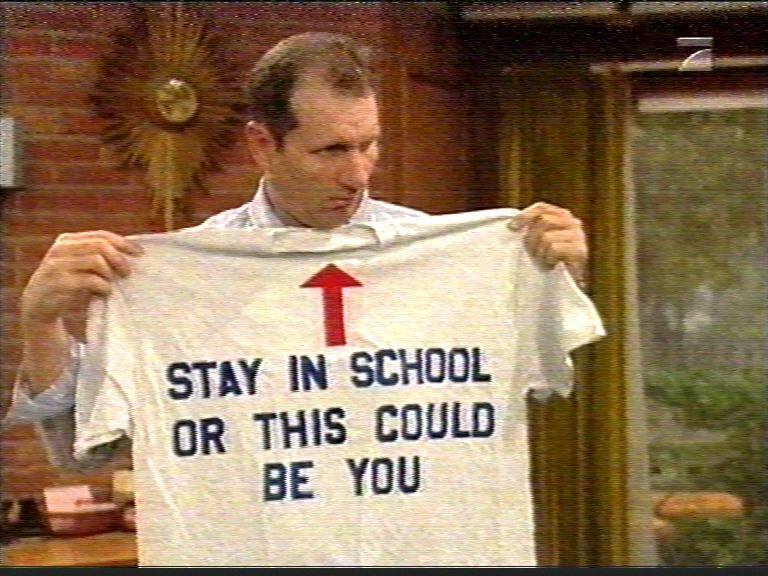 Or, you can work at a shoe store like Al Bundy. No judgment. 2. Take chances. The older we get, the more we tend to overthink things. Peter Griffin reminds us to stop second-guessing ourselves and just go for it. Mom can bail you out of jail later. 3. Keep an open mind about what you’re doing. Danny Tanner reminds us that we can pull a Miley Cyrus whenever we want and reinvent ourselves, our careers, and our idea of what constitutes appropriate dress in public. 4. Be weird. It’s 2015. If anyone tells you to “blend in” they must have been cryogenically frozen in the 50s and woken up yesterday, not realizing Hipsters are a “thing” now. Carl Winslow shows us how it’s done. 5. You’re not going to win ‘em all. The important thing is that you walk away learning something new and becoming a stronger person. Until Deebo finds you, anyway. 6. Take control of your life. Unless you’re the president or Kim K., you really shouldn’t care what people think. Follow Walter White’s advice here and just do what you want (well, maybe as long as it’s not illegal). 7. Enjoy the little things. Stupid people and frustrating D’Oh! moments will always be there. Find time to enjoy the small stuff and you won’t sweat the big stuff as much. What happens when a golf legend decides to pledge $60 million to South Florida’s leading children’s hospital? An unprecedented partnership. In March, golfing legend Jack Nicklaus — the “Golden Bear” — and his wife Barbara made a $60 million pledge through their Nicklaus Children’s Health Care Foundation to the Miami Children’s Health System. In recognition, the system’s flagship hospital changed its name to Nicklaus Children’s Hospital, and its eight outpatient centers in South Florida took the Nicklaus name as well. The move presented a few challenges for the Miami Children’s Health System, and the RockOrange team worked closely with our client, Miami Children’s Health Foundation, the system, and the Nicklaus Children’s Health Care Foundation to create an integrated communications plan. The plan included the announcement of the amazing pledge and the new hospital name, in addition to the unveiling of the new logo. As if this wasn’t enough, we also planned the official kick-off event for the Together for the Children Campaign, the fundraising campaign for Nicklaus Children’s Hospital. As we tackled the various communications challenges at hand, we had to stay focused on our ultimate goal: to position the hospital and the Miami Children’s Health System as the ultimate global destination for pediatric care. Part of the challenge was to educate consumers and internal audiences, letting them know that the Nicklaus family wasn’t just pledging funds to the system. The “first family of golf” has been an integral part of the Miami Children’s family since 2010, when they joined the hospital for the creation of the Miami Children’s Hospital Nicklaus Care Center in western Palm Beach County. It was also key to communicate that only the hospital and its outpatient centers would take the new name. Both the Miami Children’s Health System — as well as its fundraising arm, the Miami Children’s Health Foundation — would keep their name. Once the new name was announced, we worked with the foundation to reveal that Jack and Barbara Nicklaus had become the chairs of Together For the Children Campaign, and would lead fundraising efforts with a goal to fundraise $150 million dollars through 2017. This announcement was crucial, as it proved that they were committed to the partnership for the long run. The next move on the game plan included the unveiling of the Nicklaus Children’s Hospital logo in a press conference, just in time for the hospital’s 65th anniversary. It was followed by a VIP donor luncheon to officially kickoff the Together for the Children campaign. At the same time, the campaign’s celebrity ambassadors were activated through social media. This included pop artist Romero Britto, “El Gordo y la Flaca’s” Raul de Molina and supermodel Nina Agdal. Social media activation of these high-profile individuals, coupled with traditional long- and short-lead media outreach, allowed us to generate media buzz and each served as a catalyst in informing our global community about the positive impacts of the new name and logo. RockOrange, along with the Miami Children’s Health System team, secured coverage on top-tier media like CBS Miami, NBC 6, WPLG 10, El Nuevo Herald, South Florida Business Journal, CNN, Palm Beach Post, Univision, Telemundo, ESPN and many more. With exposure in over 130 media outlets, we created over 150 million media impressions, delivering solid results for our client! I’ve had the chance to do some pretty great things during my time with RockOrange. But my recent opportunity to work alongside noted design legend Paula Scher, who has been an inspiration over the course of my career, takes the cake. 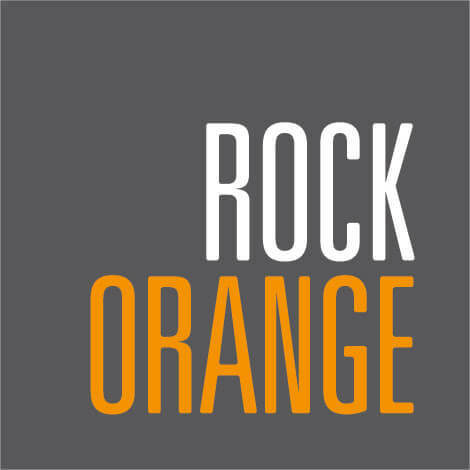 First, some background: RockOrange has been working with Frost Science to strategically develop their brand voice. The museum is preparing to move to a stunning new structure in the heart of Downtown Miami at Museum Park that promises to bring a whole new — and needed — experience to the community. As their summer 2016 ribbon-cutting draws closer, Frost Science is fine-tuning every detail to take full advantage of this singular moment. Across the aisle from us in the brand development wings is New York-based Pentagram — the renowned design firm — whose team has worked on developing Frost Science’s visual identity. Scher, one of Pentagram’s partners, is the woman behind Frost Science’s new logo and brand mark, as well as countless other powerful brands. During a late-May brand meeting, the RockStars had the chance to meet with her and the Frost team to review the new materials. Now, this is a woman who, over the course of her career, helped create iconic identity and branding systems, promotional materials, environmental graphics, packaging and publication designs for some major players, including Citibank, Tiffany & Co., Microsoft and Coca-Cola. Scher is among my favorite designers and art directors that have influenced my work, and her books sit on my go-to shelf with my other favorites by Paul Rand, Herb Lubalin and Stefan Sagmeister. My love affair with her work began when I studied her iconic work for New York’s Public Theater, featuring legendary tap dancer Savion Glover. The combination of dynamic dance photography and kinetic typography clearly communicated a sense of what the experience at the theater would be. The work was — and still is — so New York. Through Scher’s work, I learned the importance of creating work that makes people “feel.” Hearing her describe the principles behind her work for Frost Science reminded me of why I got into the creative business in the first place. 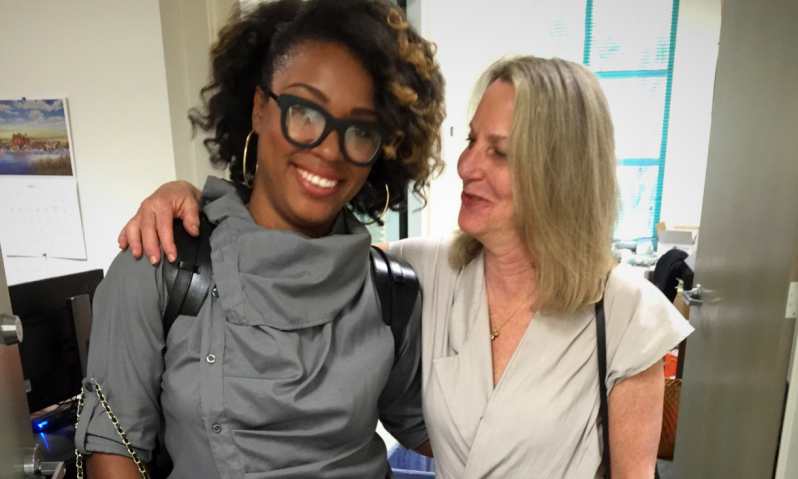 She has been a constant guiding light in my career, and I was thrilled to meet her and personally share with her what her work has meant to me. I even scored a picture!